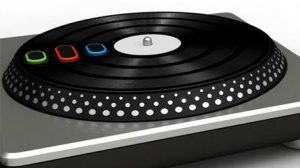 Could This Be The Infamous DJ Hero Peripheral? If this is indeed the real, legit DJ Hero controller - damn, we might have to eat every word we've said about Guitar Hero and Rock Band. If those lousy excuses for games paved the way for this then we'll have no option but to eat humble pie and accept those products for what they are. If you take the Guitar Hero concept, replace bad music with good music and actually implement a cool controller that lets you hold buttons while spinning discs - then, man, sold! Of course, the above render of a "possible" controller has leaked via Twitter - i.e. credibility is low.